You gear up and head west. 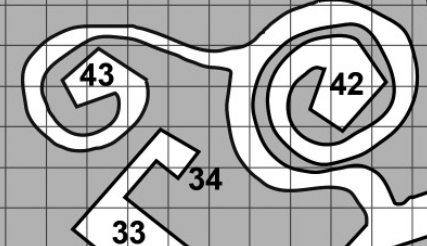 The westward corridor turns inward upon itself...as you turn the last curve in the spiral, the corridor widens and Grimma's lantern illuminates a chamber (#43). A thing stands in the center of the room, perhaps once a human but now strangely eroded into a mix of flesh and ashes, as if it had been halfway burned through at some point and yet lived on. A cloud of ash surrounds it, but its eyes glint clearly through the darkness, burning with a red and evil light. There are three man-sized demons in the room as well, their faces marked with a smear of ashes in the shape of eight outward-pointing arrows. Behind this array of supernatural foes, you can see the broken and toppled statue of a bearded man holding a sphere. Where the statue has broken open, you can see the glint of gold and jewels. Oberon feels the pull from his sword very strongly now, and has a sudden compulsion to attack the ash demon. You all recognize the creature as the one you fought (briefly) before, just after setting off the chest alarm trap. 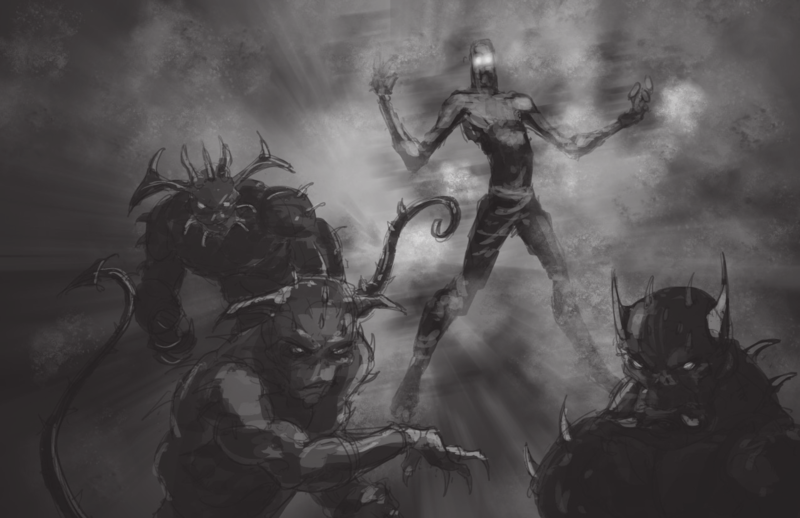 Finnr throws one of the green bottles of water at the flesh and ash abomination..."Go back to hell, filth!" Just waiting on everyone to chime in for actions before I resolve the first round. Fenwick will try to sleep the baddies, if he can. Dolgrim takes Demon Bane in both hands and raises it above his head: "Demon Bane! Grant us the courage and strength to slay this evil creature!" he shouts as he rushes in for the attack. The three lesser demons attack Oberon and Grimma, two of them on Grimma. She is injured by a demon claw but keeps fighting! The big demon lashes out with a choking ash cloud against Oberon, he begins to choke in the grip of the ash! Fenwick casts sleep but it has no effect. Dolgrim's axe burns white for an instant as the Bless is enacted, and he charges the big demon, but cannot connect in the swirling ash. Guntram [autopilot] charges with his mace raised and attacks the lesser demon on Oberon, striking it solidly. Oberon, still standing, hurls a water flask at the ash demon, as does Finnr. Both flasks hit and break apart on the demon in a hiss of steam as he howls in rage! These must be holy water! Oberon is choking on ash. Lesser demon #1 (currently fighting Oberon) is wounded. 1d20=15+6=21 1d20=13+4=17 TWO HITS for 2d6=5 damage to the ash demon. And me without a Dispel Magic memorized, thinks Fenwick as he searches his pack for holy water. He will splash holy water on the closest baddie the first chance he gets! Dolgrim will once more raise Demon Bane and strike the ash demon while spitting the guttural words to an old dwarven battle cry! Finnr will grab the second flask of holy water from the strange pool and fling it towards the Ash Demon!